• Smith & Wesson Corp. reserves the right to modify, change or discontinue this rebate offer at any time. All rebate submissions must be completed online no later than May 31, 2019. • Smith & Wesson Corp. reserves the right to modify, change or discontinue this rebate offer at any time. All rebate submissions must be completed online no later than January 31, 2019. Buy any new T/C Arms firearm and get up to a $75 Smith & Wesson® Prepaid Mastercard®! 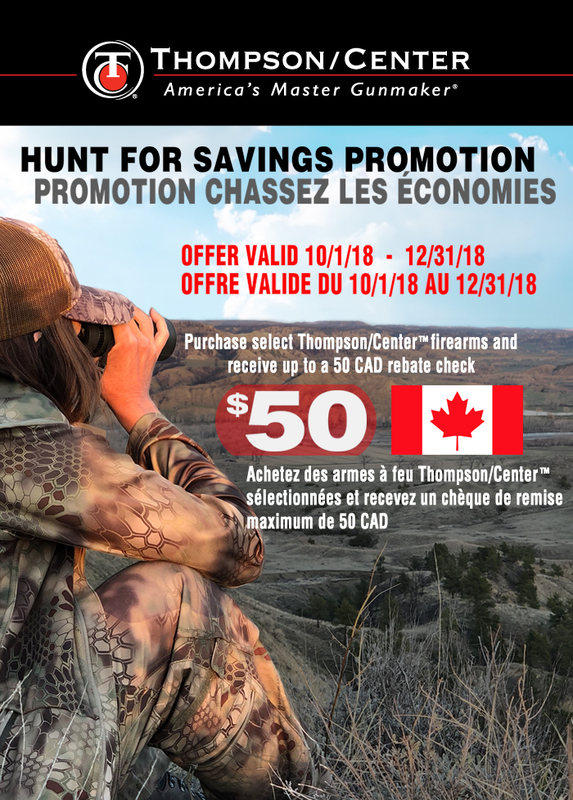 The following T/C® products are included in this promotion: Venture, Compass, Dimension, G2 Contender, Encore Pro Hunter (Includes XT and FX), Triumph, Triumph Bone Collector, T/C® Strike and T/C® Impact! 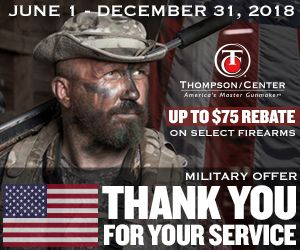 Buy any NEW T/C Arms firearm and get up to a $75 Mail-In Rebate. The following T/C® products are included in this promotion: Compass®, Venture™, Dimension®, G2 Contender®, Encore® Pro Hunter, Triumph®, Triumph® Bone Collector®, T/C® Strike™ and T/C® Impact™. 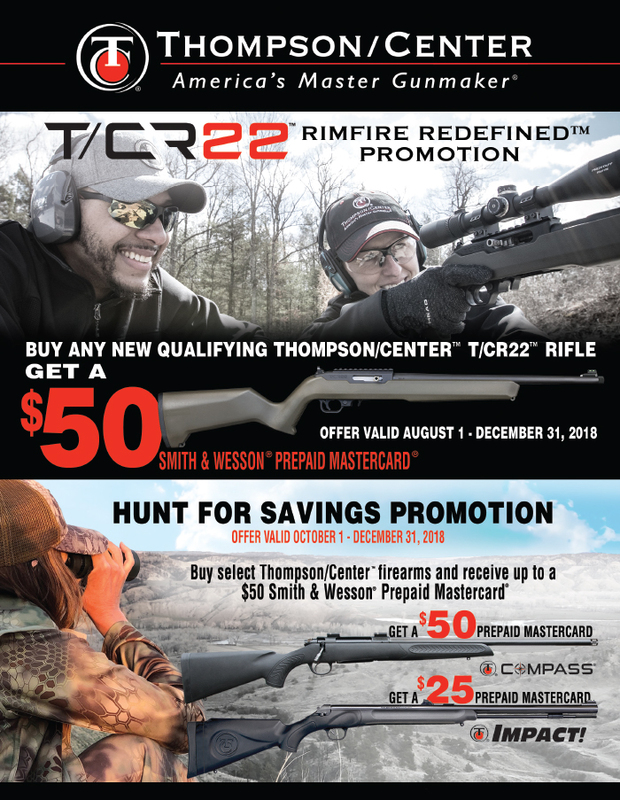 Get a $75 mail-in rebate on any new T/C® Compass®, T/C® Venture™ or T/C® Dimension rifle, T/C® G2 Contender® pistol, rifle or frame assembly and also T/C® Encore® Pro Hunter™ pistol, rifle, muzzleloader (FX and XT) or frame assembly. 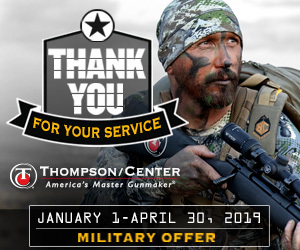 This offer is available to ALL active duty U.S. Military, Retired Military with retired Military Status, active National Guard Reservists and Disabled Veterans of all U.S. Military branches including U.S. Coast Guard. 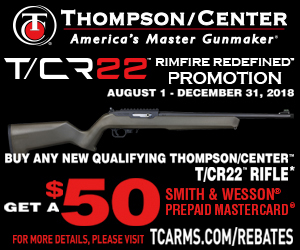 Venture, Venture Compact, Venture Predator, and Dimension Rifles qualify.